During the recent school holidays, we visited the SA National Birds of Prey Centre. The centre focuses on the rehabilitation of different types of birds of prey. They use falconry methods to train the birds, and to prepare them to re-enter nature. Unfortunately, only those that are 100% fit will survive in nature, so the centre also plays a big part in education and breeding. 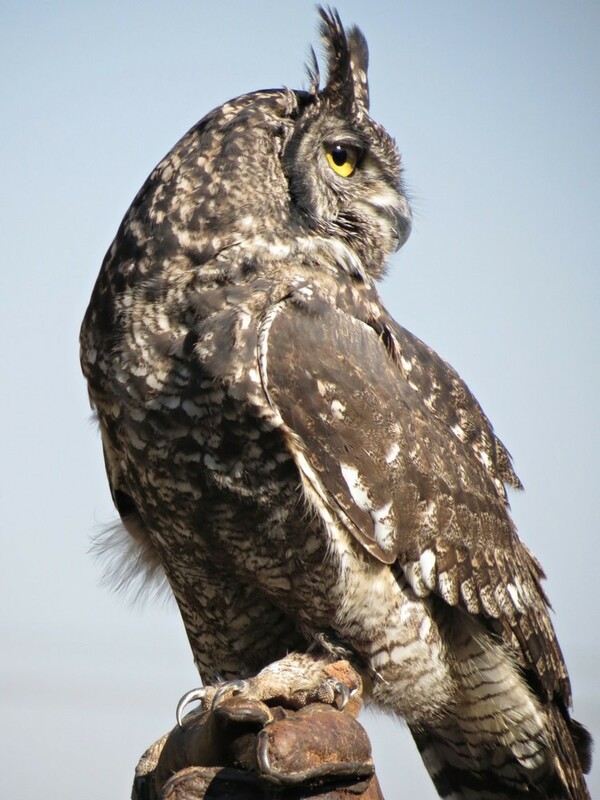 During the visit, this Spotted Eagle Owl would fly from the one trainer to the other. What I found most amazing was the virtual silence with which an owl flies. At the end, we also had the opportunity to pose for a photo with one of the birds of prey. What a beautiful bird! I read that owls are able to fly silently so they can sneak up on their prey, since they mostly hunt at night, when it's quiet to begin with. Thanks for this interesting item. I love to read your postings, Bessie, please don't stop! Thanks for the feedback! I love nature and I am so grateful that, due to modern cameras, we can share with one another the beauty that we see all around us. This looks very much like the Great Horned Owl that we have here in Canada. Magnificent birds! All owls are silent flyers; the softness of their feathers is how they do this.